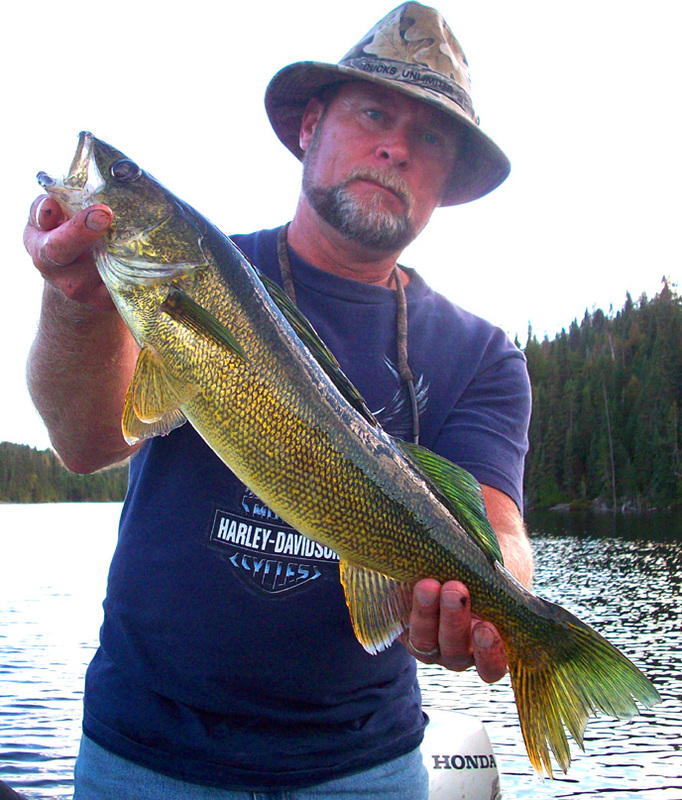 Walleye are an important species in Prairie Bee Lake and they can be caught in good numbers. If you have never fished the lake before then you can expect to spend the first day or two finding the hot spots before you start hooking better numbers. We will also give all guests orientation on the lake and point out the best areas. 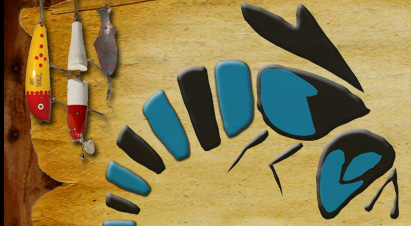 There are many factors involved with predicting how many Walleyes you will catch per day. On a slower day you should be able to catch around 20 Walleyes and on a good day you should be able to catch over 40. Guests who have been fishing the lake for years have gained knowledge of the lake and we have had guests tell us they have caught over 50 Walleyes in a day. Walleye are common in the 1 to 3 pound range. During a week of fishing most guests will catch a few bigger ones. There are big trophy Walleye in the lake and a few guests will catch them in the 30 inch range. Because Prairie Bee Lake is designated a trophy Walleye lake and all Walleye over 18 inches have to be released, the number of trophies is growing each year. In the last few years we have had a few guests catch Monster Walleyes over 30 inches. A 30-inch+ Walleye is usually around 10 pounds. The Walleye fishing is great all year. In the spring, the Walleyes are in the shallower waters off the shoreline. As the water warms up they go a little deeper. Generally Walleyes in the 1 to 3 pound range will stay in 10 to 15 feet of water during the summer or even shallower in places with good weed cover. The big trophy Walleyes are almost always females and they will stay a little deeper in the 20 to 30 foot range. The best way to plan your day is to spend the morning along the weed beds and rocky points catching the good eating size Walleyes for shore lunch and then in the afternoon try going a little deeper and you will start to get a mix of smaller and larger Walleyes. In the evening right before dark until about an hour after dark the big trophy females come out of the deep and patrol the shoreline for minnows. At this time trolling just off shore in about 6 feet of water with a blue floating Rapala or Thunderstick will produce your trophy. Typically walleye fishing is the best in the morning and evening. During the spring and fall when the water is cooler, the majority of fisherpersons use jigs and slip bobbers in 15' of water and less. As summer approaches and the water temperature rises, trolling with bottom bouncers, 3 way set-ups, or drift fishing becomes more productive in deeper water where structure is found. Fishing on the points, humps, and drop offs around the islands should provide you with ample opportunities to catch your walleye. 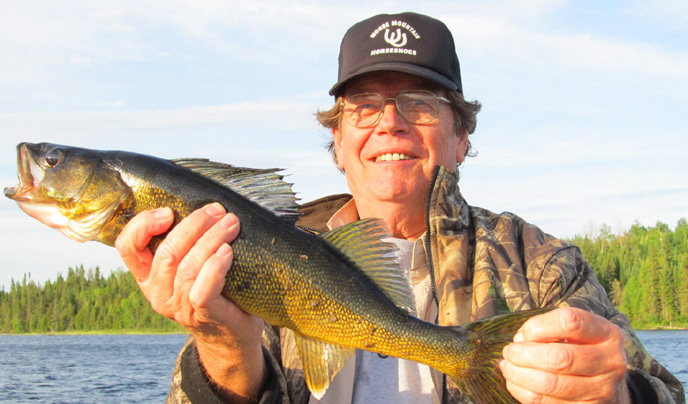 Live bait, such as worms, leeches, or minnows are a very good choice for our northern walleye. Protected size for walleye: It is camp mandatory that all walleye 18 inches and above be returned to the water.